Bates, Schaffenberger and Chiaramonte bring back Vartox, the hero of a far-off world, in Action 475 (Sept. 77). 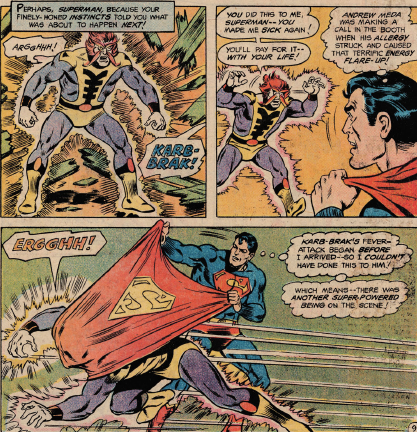 Vartox had debuted in the pages of Superman a couple of years earlier, this marks his second appearance. Vartox is operating as the hero of his world, but he finds his powers weakening. 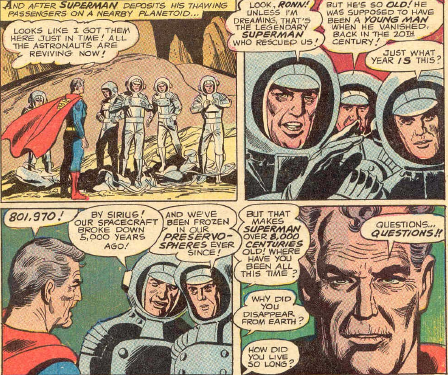 He considers asking advice from Superman, and scans Earth, but finds something even more interesting. Vartox learns of Karb-Brak and his ailment, and speculates that his allergic reaction could recharge Vartox’s failing powers. He heads to Earth, but keeps out of sight. Karb-Brak mistakenly assumes that it is Superman who caused his flare up. Karb-Brak even attacks a second time, while Clark is giving a live broadcast. Vartox is hovering just outside the building, and caused this allergic reaction on purpose. Not very nice for a hero. Lori Lemaris gets, I believe, the only solo story she ever got, by Elizabeth Smith, Win Mortimer and Frank Chiaramonte, in this issue. It comes quite out of the blue. The last time Lori Lemaris appeared was in the Virus X storyline, almost ten years earlier. 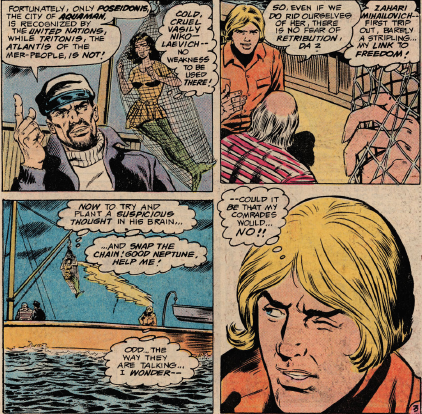 Lori gets caught by a Russian trawler, illegally fishing. She uses her telepathic powers to turn the crew against each other. We find out that only Aquaman’s city of Poseidonis is recognized by the United Nations. The mermaid city of Tritonis has no legal standing. 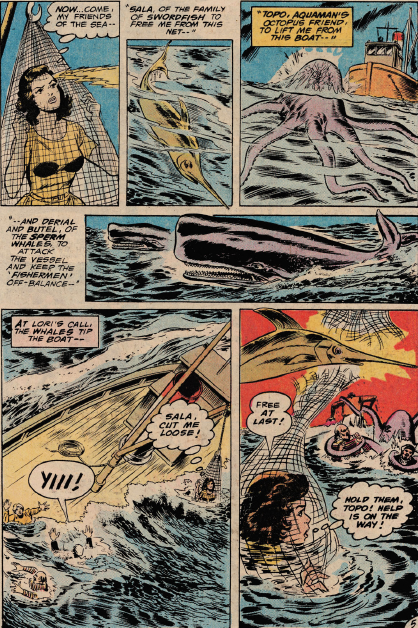 Lori also summons a number of sea creatures to help her escape by capsizing the boat, including Aquaman’s “pet” octopus, Topo. It’s a good outing for a character that has never had a solo story before. 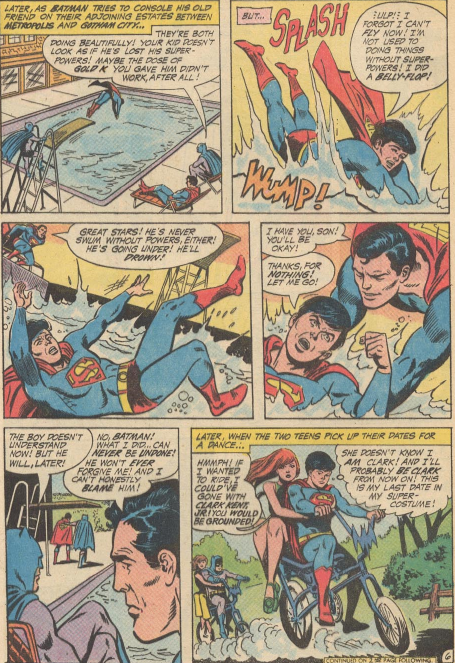 And Lori did not have to wait nearly so long for a return, appearing the following month in the Superman Super-Spectacular. 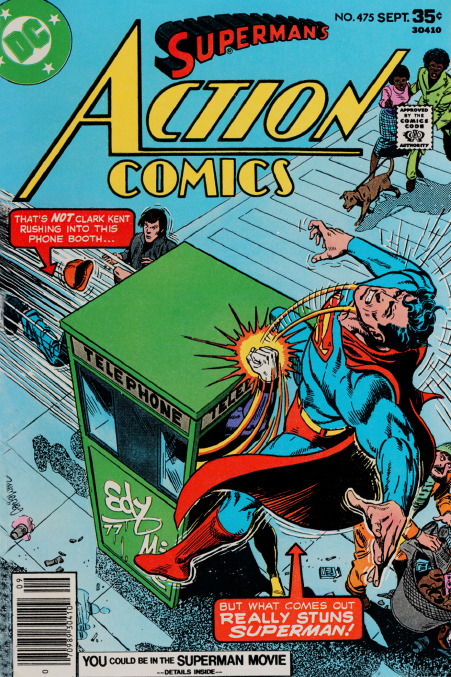 The Super-Sons get equal play on the cover of Action 392 (Sept. 70), but inside it’s really Superman and his son that are the focus of this Kanigher/Andru/Esposito tale. Following up on last issue, Clark Jr no longer has powers, after his father exposed him to gold kryptonite. Despite this, he continues to wear his costume, even though it simply highlights his lack of super-ness. But you have to wonder why he wears while out on a date, when he doesn’t have the powers to back it up. Public humiliation is rarely a big turn on. Superman winds up getting attacked by thieves with kryptonite. His son comes to his aid, and because his powers have been removed, his weakness has gone as well, and he succeeds at both rescuing his father, and capturing the villains. 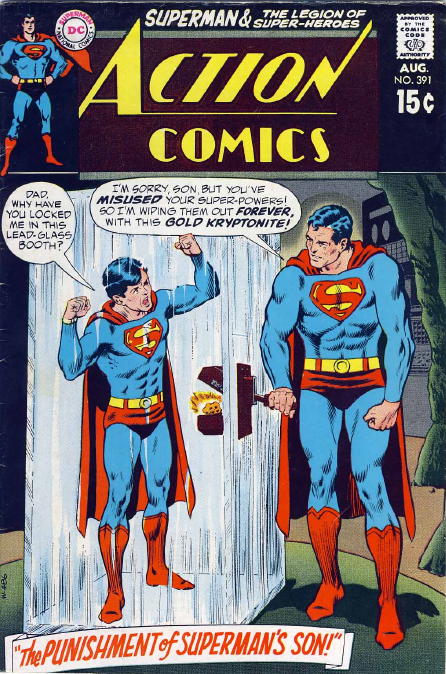 As a reward, Superman brings his son to Kandor, and together they undergo his rite of passage to adulthood. But the boy is unaware that his father has also rigged the ceremonial bracelets, transferring his powers to his son. Though Superman is left powerless at the end of this story, when the Super-Sons return in a semi-regular series in World’s Finest Comics in a couple of years, Superman has his powers again. Bates, Mortimer and Abel bring the Legion’s series in Action Comics to a close with this story. 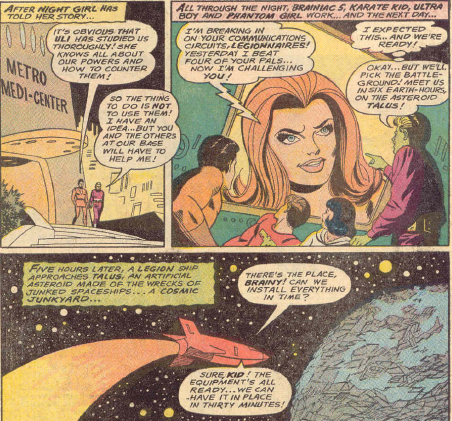 Saturn Girl and Princess Projectra return from a mission, only to find that no one knows who they are. Karate Kid insists that they have never been members of the Legion, and even introduce them to male counterparts of themselves. 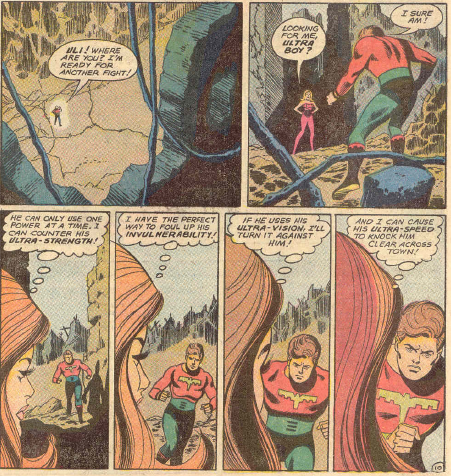 Saturn Girl wears her new, 70s bikini outfit in this story, which looks much better on her than on Saturn Lad. 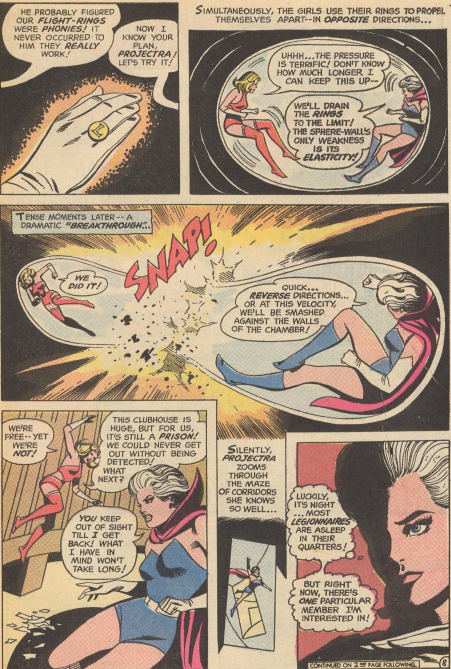 The two women are imprisoned, but use their flight rings to burst free of their bubble-cell. 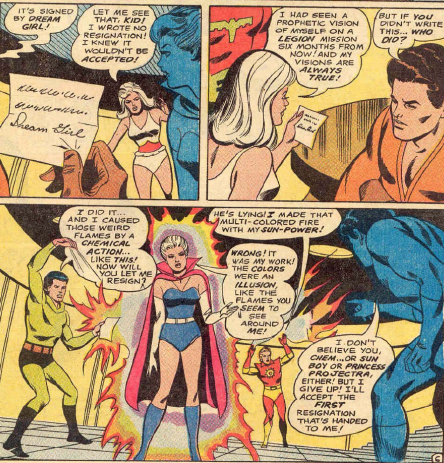 Projectra figures out that the whole thing is a hoax, which Saturn Girl must be in on. And, indeed, it is. All put together by Brainiac 5, to test Projectra’s mettle, after the computer declares that Projectra is likely to have a breakdown. It seems rather insulting, but throughout the 70s Projectra would lapse into a few stress-induced comas, so the computer was not wrong. The story, and the run, end with Mon-El being sworn in to replace Karate Kid as leader. The “adult advisor” is there, which must be Marla Latham, although the figure is so tiny it might be Ultra Boy, as their costumes are basically identical. 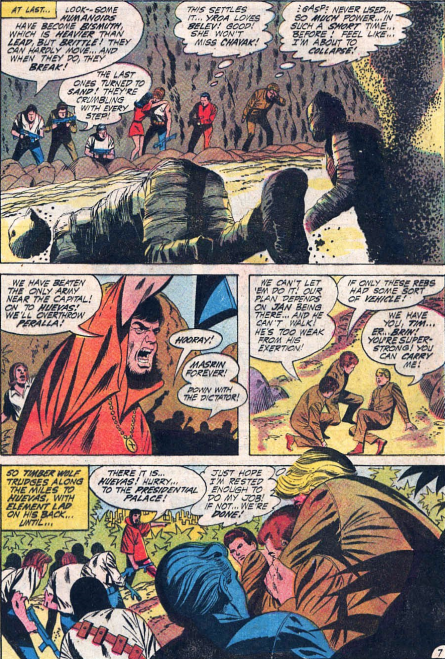 From here, the Legion of Super-Heroes move down to becoming a sporadic back-up in the pages of Superboy. The team all but vanishes, and it was only the avid fan base that brought about their return. 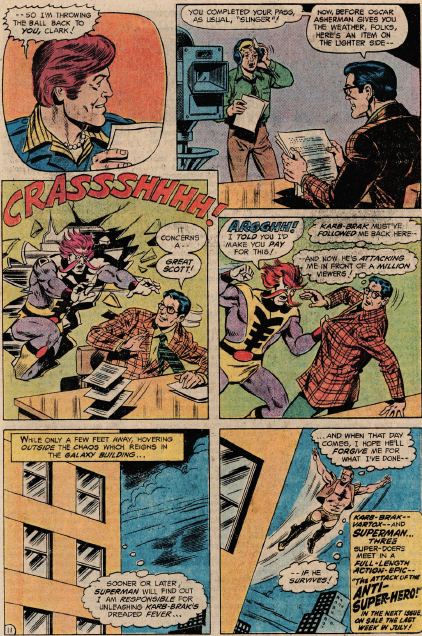 Robert Kanigher, Ross Andru and Mike Esposito begin a 2-part early adventure of the Super-Sons in Action 391 (Aug. 70). 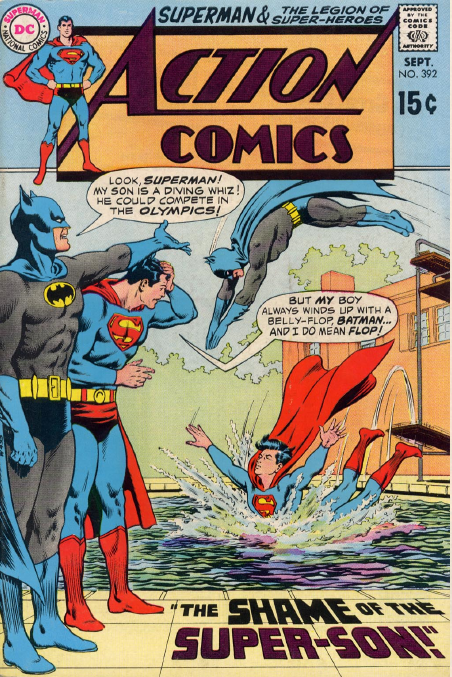 Both Superman and Batman act somewhat out of character in this tale. 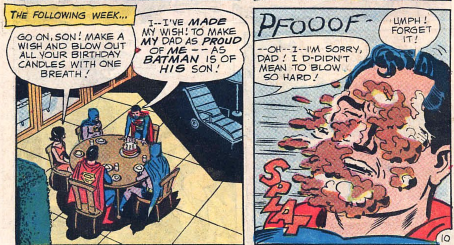 Batman is a casual braggart, scoring points on Superman through the actions of their children. 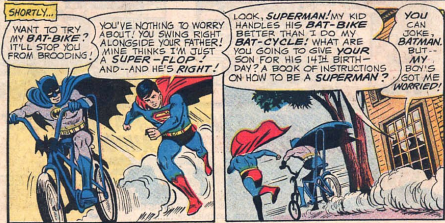 Batman Jr is a bit nicer, while Superman Jr does his best, despite not having good control of his powers, and being impulsive. Yeah, that whole lack of control thing can be a good excuse sometimes. 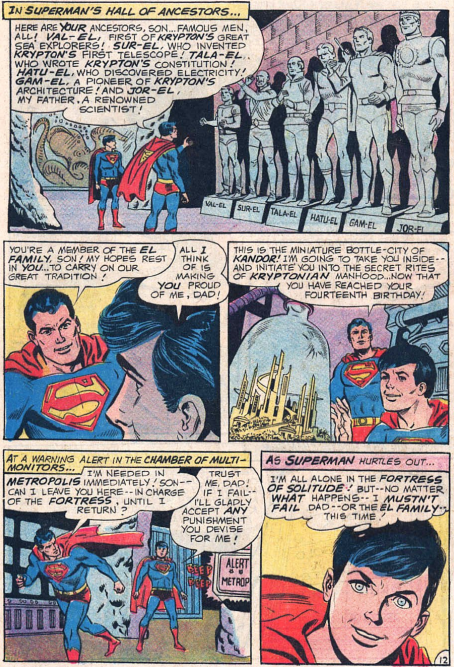 Superman takes his son to the Fortress of Solitude just before his 14th birthday, showing him the statues of their ancestors, as well as Kandor. 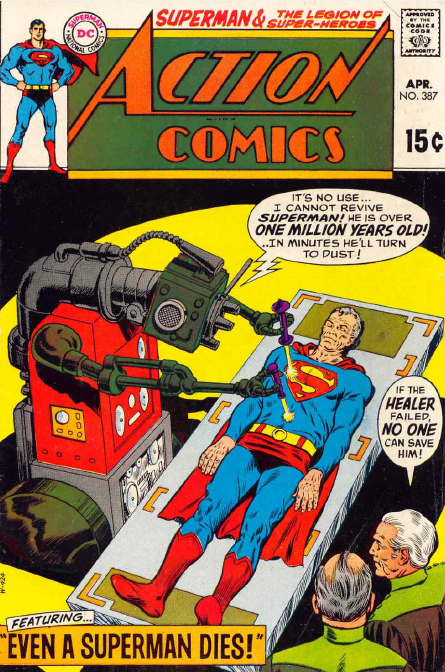 He has prepared a Superman Jr robot, to help train him, but the boy thinks the robot is intended as a replacement, and they get into a big, destructive battle in the Fortress. 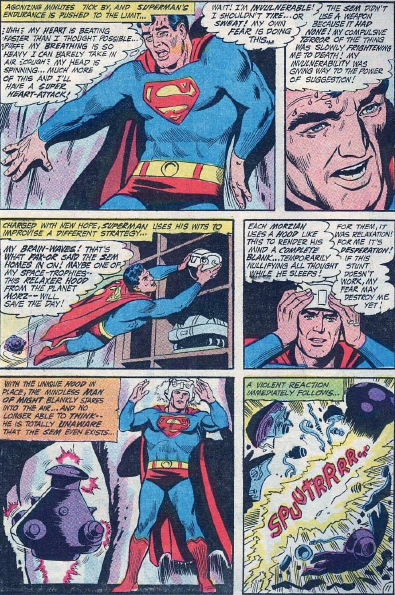 As the story ends, Superman exposes his son to gold kryptonite. 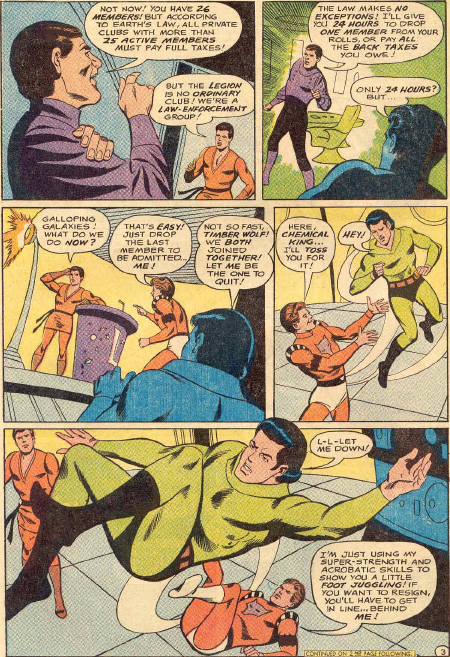 Bridwell, Mortimer and Abel conclude their Legion Espionage Squad story in this issue. 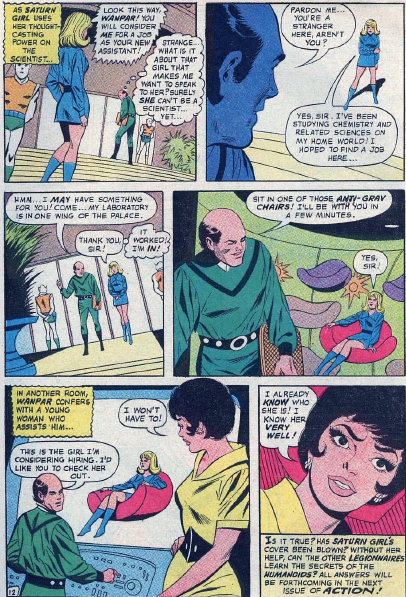 Saturn Girl is recognized as a telepath from Titan, by another woman from her planet – but not as Legionnaire. So her infiltration proves successful. She learns the government plans, which she relays to the Legionnaires who are with the rebels. While the rebel leader is a Dark Circle pawn, most of the rebels themselves are not, and the Legion decide which of the rebels should be the new leader. 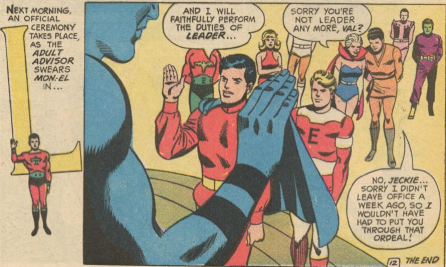 Element Lad pretty much single-handedly overthrows the government forces, though it exhausts him, and later uses his powers to make it look like the rebel leader has lied to his followers about the government’s treasure. 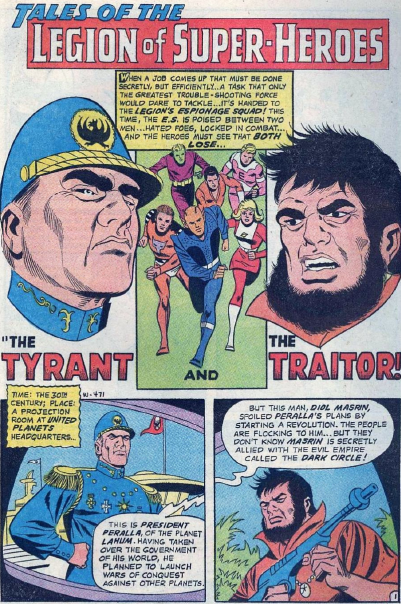 So in the course of this story, the Legion not only overthrow a government, they also frame a rebel leader, and instal a person of their own choosing to rule the planet. No wonder the Dark Circle oppose them. 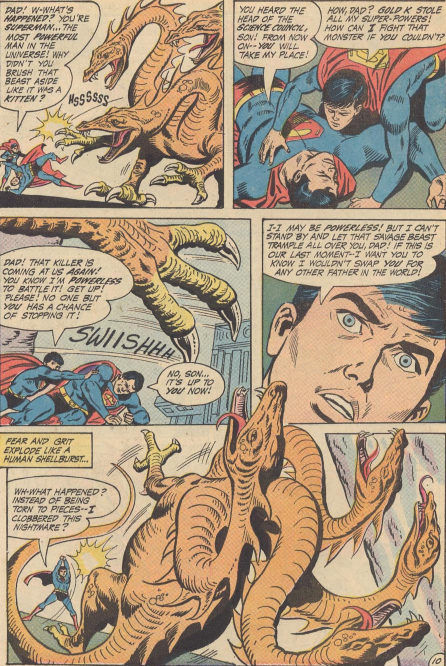 Bates, Swan and Roussos make Superman turn chicken in Action 390 (July 1970). 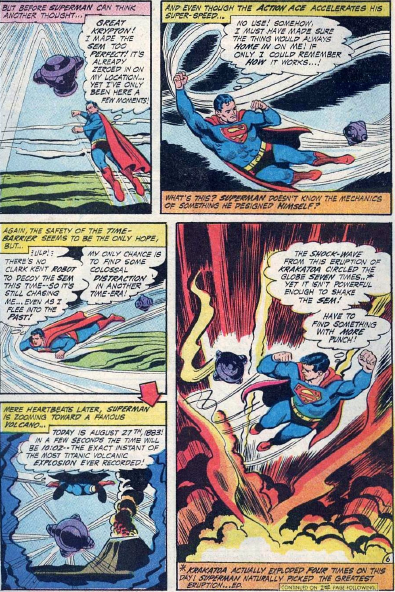 Superman gets chased by a mechanical bomb, which defies all his attempts to evade or destroy it. 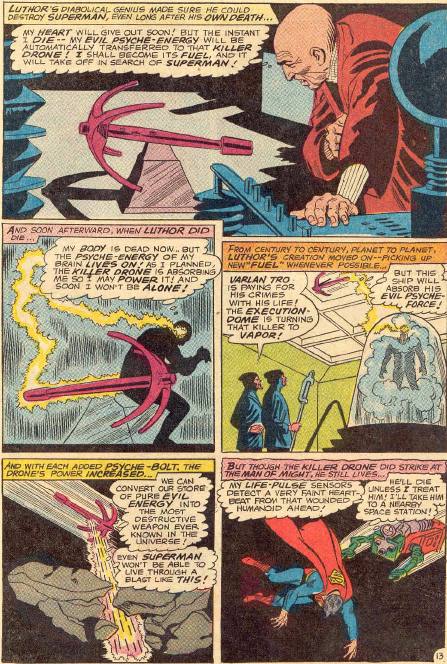 He even flies through time, bringing the machine along with him to the explosion of Krakatoa, but it has no effect. 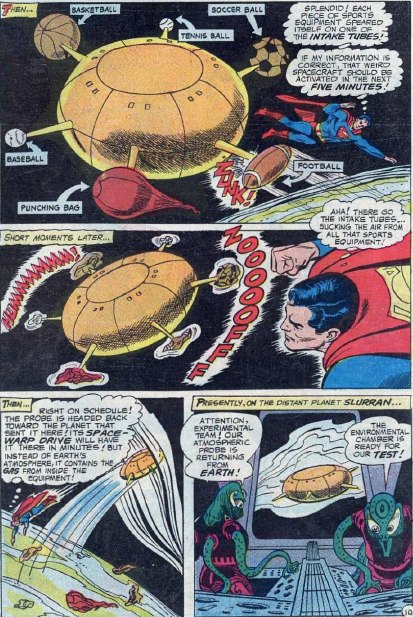 Superman determines that the bomb is of Kryptonian origin. 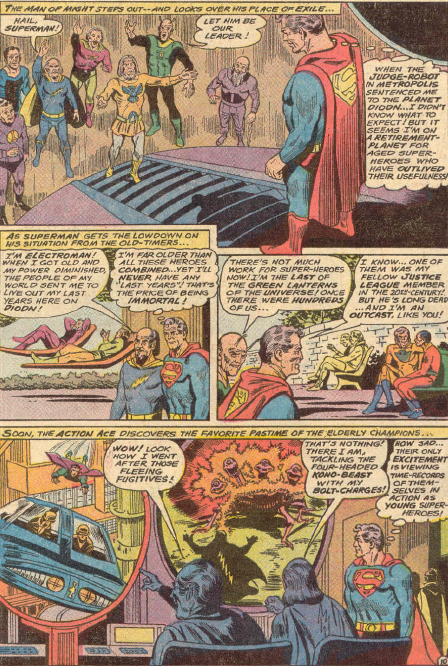 Contacting the Kandorians, he discovers that it was built by Jor-El, and is attuned to his brainwaves, and capable of following him anywhere. 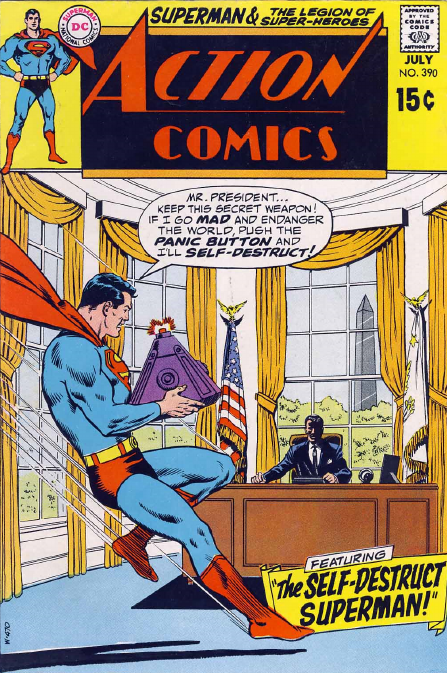 Eventually, Superman figures out that it is not so much a bomb, as a device designed to scare him to death. It was designed as a weapon against alien invasion, and powered by the fear of those it pursues. 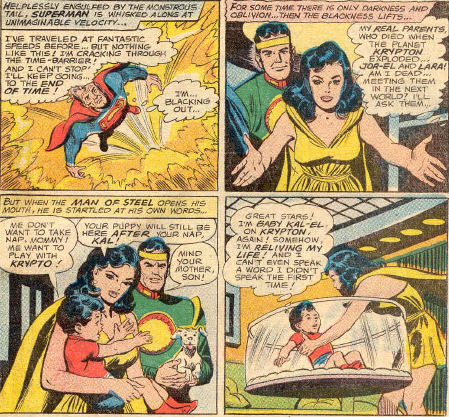 Superman had encountered it as a baby in his father’s lab, and it scared him then. His adult reaction is a result of those memories. All Superman has to do to deactivate the device is to stop being scared, which he does. 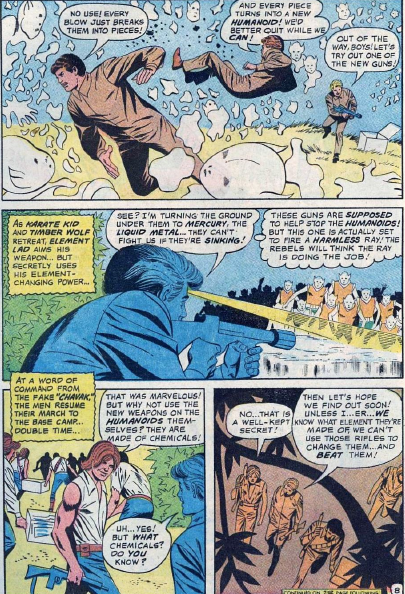 The Dark Circle are behind the events in this story by Bridwell, Mortimer and Abel, although they do not appear in person. They are behind the troubles brewing on Lahum, where rebels seek to overthrow a militaristic dictator. The mission is handled by the Legion Espionage Squad, which is under the command of Chameleon Boy. He selects Saturn Girl, Brainiac 5, Element Lad, Karate Kid and Timber Wolf as his team. Proty II briefly appears, his final appearance until the 80s. The Legionnaires infiltrate both sides of the dispute. With the rebels, they pretend to have powerful weapons that can stop the government’s android army in their tracks. 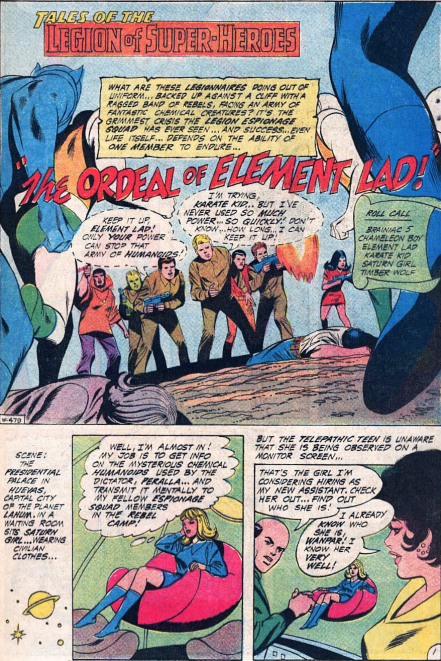 In reality, the weapons do nothing, it’s Element Lad’s powers that do all the work. 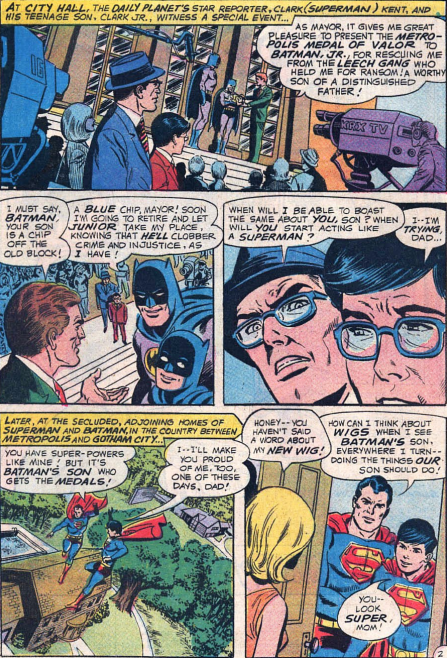 Leo Dorfman joins Curt Swan and George Roussos for Action 389 (June 1970). 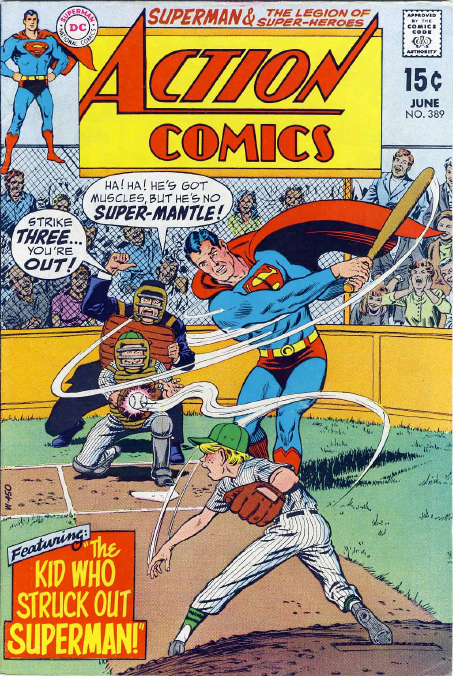 Clark Kent heads out to write a story about spring training for the baseball team in Metropolis, when he suddenly decides to start playing as Superman. 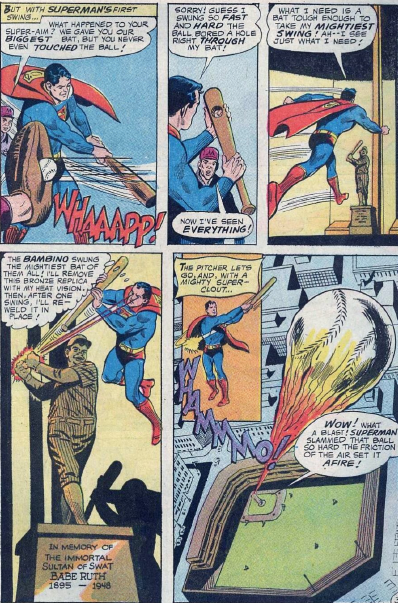 Over the next few days, Superman takes up a variety of sports, always sending some piece of equipment high into the sky. Jimmy Olsen thinks Superman is just showing off. After all their years together, Jimmy should know better. What appeared to be pointless actions were actually a clever plan to forestall an alien invasion, by using the sports equipment to send false information to the alien’s sensors. 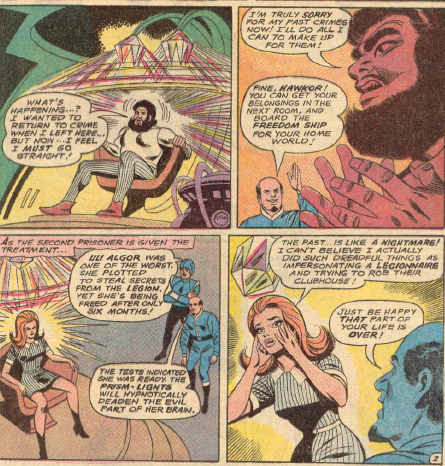 Cary Bates takes their reins of the Legion of Super-Heroes series with this issue, joining Win Mortimer and Jack Abel. The story deals with a severed robotic head, seeking vengeance against the Legionnaire who decapitated him. 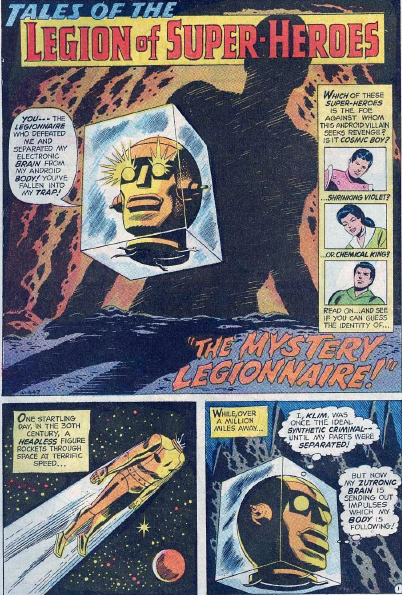 The best sequence is the flashback, as the robot experiences the effects of the various members’ powers, without seeing the Legionnaires themselves. It turns out his severed circuits are faulty. 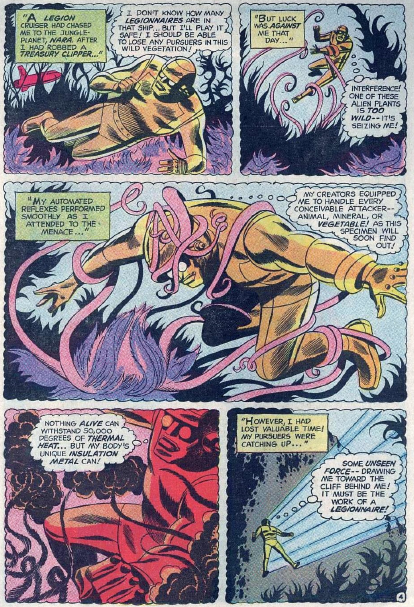 He saw a composite formed of both Cosmic Boy and Chemical King, so he had been hunting a member who did not actually exist. The robot tries to blow itself up in anger, but Shrinking Violet managed to get into the head and deactivate it. Not a mind-blowing story, but decent. And it uses Chemical King, who rarely got featured. 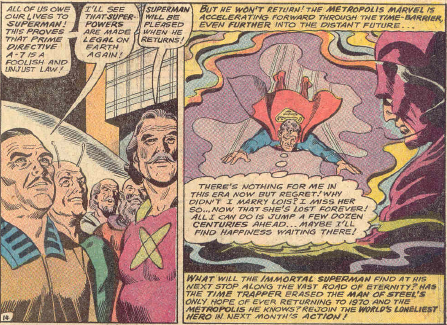 Bates, Swan and Roussos conclude Superman’s travel through time in Action 387 (April 1970). He encounters some astronauts, frozen in suspended animation for centuries, and revives them in the year 801,970. Travelling even further into the future, he reaches a time when the entire planet is dead and devoid of life. If those are different. Anyway, he cuts the planet open and terraforms it, and brings life forms, including humans, from other worlds to populate it and start the cycle again. There is a very unexpected attack from Lex Luthor. He had never believed Superman dead, and left behind a weapon, powered by his eternal hate, to kill him. It fails. 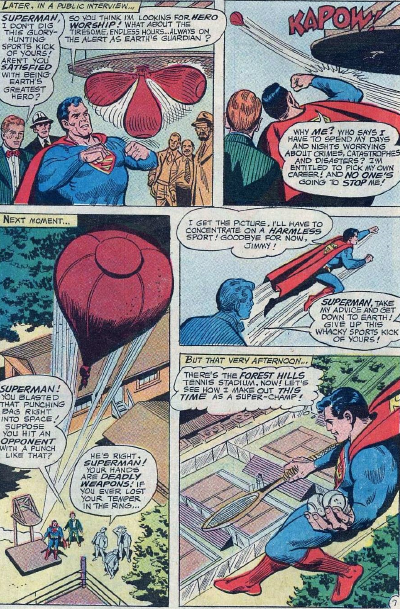 Superman travels even further ahead, but Time Trapper loops him, and sends him back to the start. He blacks out, waking to find himself a baby in his parents arms on Krypton. A few more blackout time jumps, and Superman is back to where he was at the start of the saga. Which is a bit of a let-down finish, if you ask me. 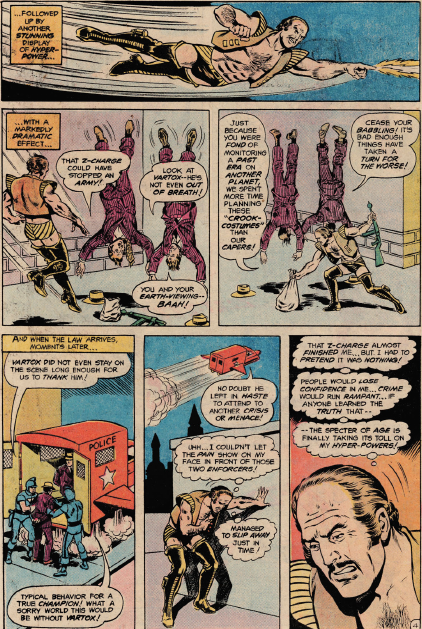 Bridwell, Mortimer and Abel share one of the oddest Legion stories. Every single member appears. Even the Super-Pets appear. And I’m tagging them ALL. And the board is also worth noting, on the first page. 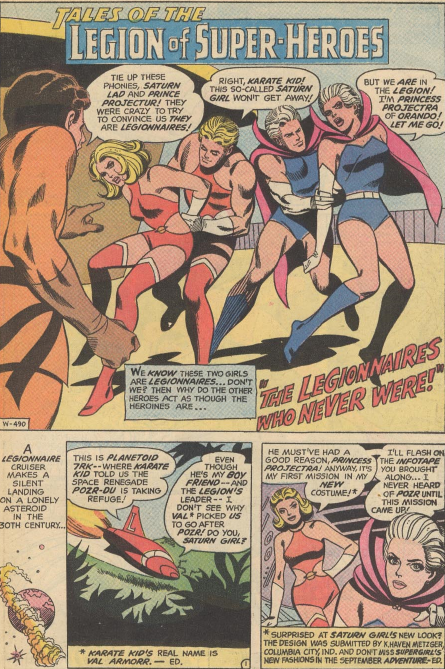 The Legionnaires appear in the order they joined the team. 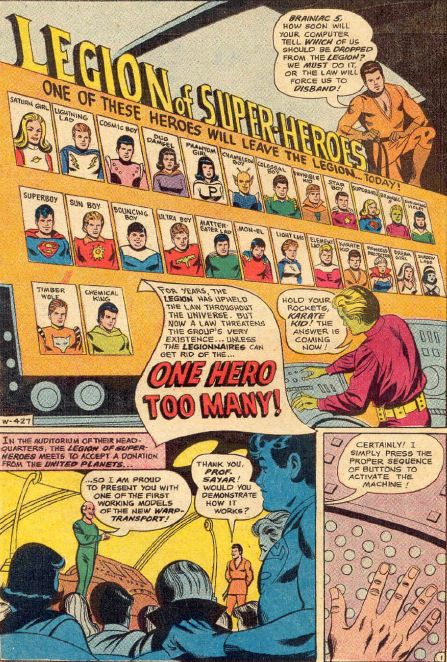 Supergirl is located between Star Boy and Brainiac 5, while Superboy is later, between Shrinking Violet and Sun Boy. An evil tax man shows up, and the Legion discover that they have to get rid of one member, or have to pay taxes. As they do not actually make money by being the Legion, I’m not sure what they would be taxed on, but it’s enough of a threat that they all start vying to be the one to leave. Timber Wolf and Chemical King are the first to offer, being the most recent to join. The team attempt to hold a random draw, but it gets rigged, and then everyone starts claiming responsibility for rigging it. Supergirl insists that she should be the one to leave, as she attends the fewest meeting. 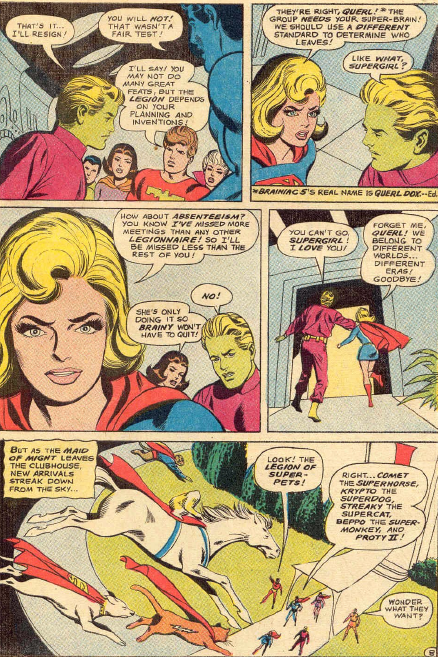 Brainiac 5 is not happy, and the Super-Pets all but revolt, insisting that they will disband if she leaves. 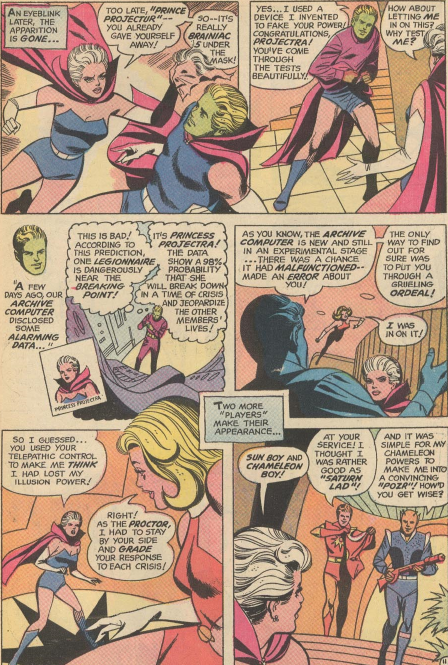 Brainiac 5 is selected by the computer as the hero who performed the fewest feats, but everyone insists his mind is worth more than just feats. Finally, it is Superboy who chooses to leave. His powers are duplicated by Mon-El, and he has no romance or clinging pets, as Supergirl does. Notice that Krypto would resign if Supergirl left, but not Superboy. Duo Damsel is the one most upset about his departure. 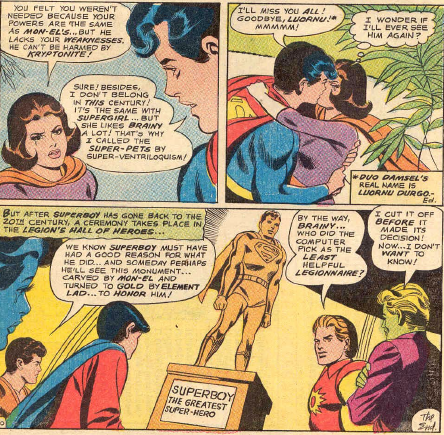 Luornu’s unrequited love for Superboy would be touched on again in the future. 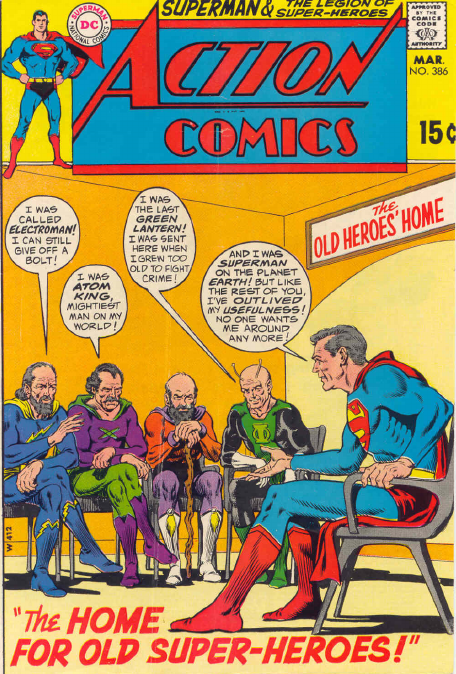 For many of the characters, this was the last appearance they have before the end of the Legion’s run in Action Comics. Ironically, this is also the last appearance of the full line up of the Super-Pets, as Beppo does not appear again, aside from flashbacks in comprehensive Superman origin tales. 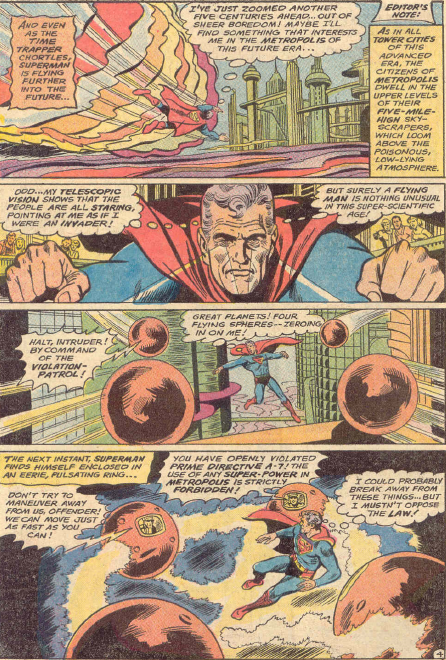 Superman continues travelling forward in time in the second part of the story, by Bates, Swan and Roussos, in Action 386 (March 1970). Superman time jumps forward, and winds up in an era where all super-powers have been outlawed, following a huge war of super-powered people. 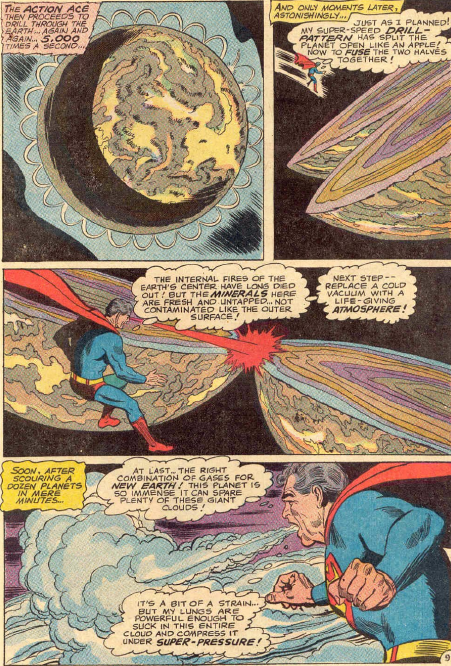 Superman winds up exiled to a planet where all the other super-people have been sent. King of the retirement home. He does get everyone to work together, and show the world that old super-heroes have something to offer. But then he just time jumps again, as the Time Trapper watches, enjoying it all. 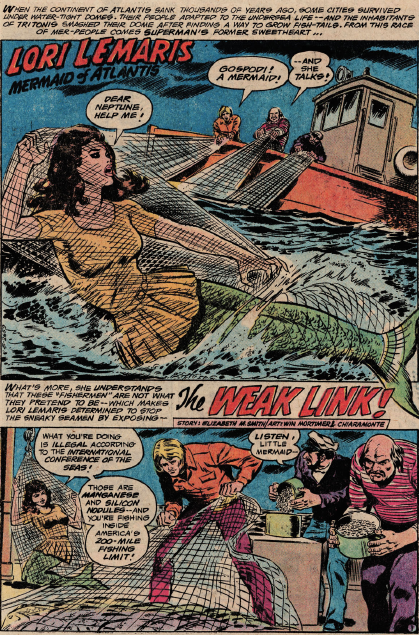 Uli Algor, the woman who impersonated Shadow Lass, returns in this story by Bridwell, Mortimer and Abel. It begins on Takron-Galtos, the prison planet, which I believe is the first time that entire name and description are used. Despite the scary name, they are using feel good gem therapy, it seems, to rehabilitate criminals. It does work on some, but Uli had conditioned herself to resist it. Returning to Earth,she sets out to avenge her defeat against the Legion. 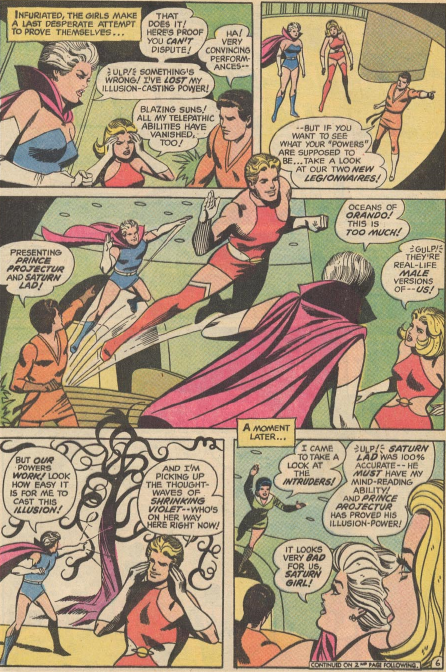 She runs into two couples in the park, challenges, and defeats Lightning Lad and Saturn Girl, Cosmic Boy and Night Girl, with a device that enables her to turn the heroes powers against them. That might have been enough for some, but not for Uli. 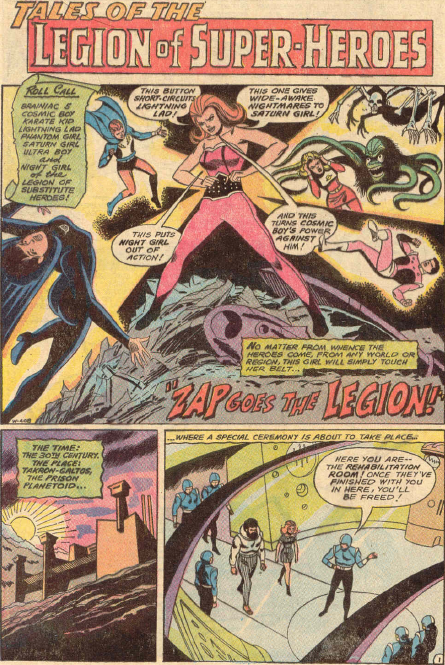 She presses her luck, and challenges another group of Legionnaires. Karate Kid, Brainiac 5, Ultra Boy and Phantom Girl accept her challenge, and head out to Talus, an asteroid of junked space ships. This is the only appearance of Talus until it becomes the headquarters of the Legion, in the early 90s. 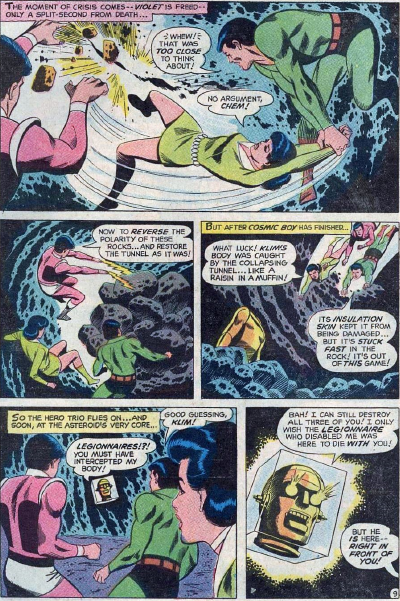 Uli uses her weapon successfully against three of the team, but she waits as Ultra Boy approaches her, to see which of his repertoire of one-at-a-time powers he will use. And Ultra Boy just runs up and decks her, using nothing but his own strength. Uli heads back to Takron-Galtos. We never hear from her again.